Both men and women snore. Sure, it’s a bit of a turn off for some of the women out there but that’s reality. Everybody snores. It’s just that there are more men who snore. There exist anatomical differences in the bodies of both women and men that cause men to take the lead. 4 out of every 10 men snore, in comparison to roughly 3 out of 10 women. Here’s a good reason why men snore more than women. Men are born with air channels that are narrower than women’s—and this causes unpleasant noise during night time. The narrower the air passage, the harder it is for the oxygen to flow during the normal breathing activity. Also, when air is forced through a narrow opening, the tissues surrounding it vibrate aggressively and snoring becomes louder as a result. Statistically, men consume alcohol more often than females do; they are also more likely to consume it in excess. The tendency to smoke is more in men as compared to women, leaving them vulnerable to snoring as a side effect. That explains why women are usually portrayed as victims of snoring partners. Nonetheless, that doesn’t change the fact that women snore as well. There are a lot of reasons why women snore. Weight gain is one of the reasons why there are snoring women. Transitional phases such as pregnancy, menopause, and hormonal imbalance can really change a woman’s metabolism. Often times, a change in a woman’s metabolism leads to weight gain. Weight gain is one of the reasons for snoring loud. Hormonal imbalance, pregnancy, and menopause are the transitional phases in which there is an alteration in a women’s metabolism. Snoring and weight gain are closely associated. Excessive weight leads to skin build up around the neck area. This excess fat narrows the air passage and causes a hindrance in the airflow, resulting in the loud sound that we call snoring. Exhaustion can also cause women to snore. Since the muscles are more relaxed when the body is tired, loud snoring is most likely to happen. The larynx gets very relaxed when they are tired and it causes the snoring effect or pattern. In line with that, it’s interesting to note that women are more tired than men nowadays. With more and more women taking on more tasks, in and out of the home, it’s no surprise that they end up exhausted at the end of the day. Who can blame them if they end up snoring? While snoring is inevitable for some women out there, there are ways to prevent it. They could try to lose weight or simply change their sleeping position. It’s been proven that back sleepers tend to snore more than side sleepers. So maybe a simple change in sleeping position could help. Now, if the snoring is really bad and simple solutions aren’t helping at all, then it’s time to take some action. Truth be told, snoring women face the danger of acquiring a serious health condition called sleep apnea. Besides its social stigma, snoring can signal underlying health problems. In the most serious cases, it’s a sign that something is blocking your windpipe and preventing oxygen from getting to the brain; this is a potentially dangerous condition known as sleep apnea. Sleep apnea can take a dangerous toll on a woman’s body. A serious heart disease is just one of the dangers a snoring woman faces. The dangers snoring women face are very real. 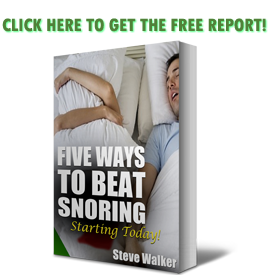 If snoring women don’t look into treatment, they could easily endanger their health. A snoring mouthpiece like the one featured on https://snoringmouthpiecereview.org/good-morning-snore-solution can easily reduce, if not, eradicate, the snoring.